From fleeing war-torn Democratic Republic of Congo, to representing Banyana Banyana and playing professional football in Spain, Ode Fulutudilu is a torchbearer for women’s football in South Africa. She was only three years old when her family was uprooted and left an unstable DR Congo for neighbouring Angola, but the Southern African country was far from safe and it meant they made the move further south to Cape Town, South Africa. “My family and I left DRC in 1993 as it was unsafe for us to be there. We went to Angola after leaving Congo and my sister was born there,” the 28-year-old said. “However, Angola also proved to be dangerous as the civil war there started to get pretty bad. Her father eventually joined the family in Cape Town and once they were settled, Fulutudilu soon started to discover her love for football and, with most girls her age not interested in sport, she found herself “hanging out” with boys. Away from the pitch, life took a few more interesting twists as she was placed in the care of a foster mother who shared her passion for football. Her talents were eventually spotted by local women’s football clubs and a few years later she found herself playing in the semi-professional Sasol League. But she always had that burning ambition to play overseas and was soon able to realise her American dream with the help of her foster mother. After returning to South Africa in 2014, a Banyana Banyana call-up followed as she realised another dream. On the back of a successful spell with Cape Town Roses that saw the club win the Western Cape Sasol League and Coke Cup, and finish runner-up in the 2017 Sasol League National Championships, it was time for even bigger and better things. What often sets the elite apart from the masses is their desire to continue to test themselves at higher levels and that’s why Fulutudilu journey took her to Finland’s Naisten Liiga in 2018. “I had an agent who was looking for a team for me for two years,” she said. “Then in April ONS Oulu Women in Finland needed a striker and saw clips of me playing and were interested in signing me. “The whole process was incredibly smooth as I signed my first pro contract and soon moved to Finland. ONS managed to finish eighth again, but it meant they went into the relegation playoff group instead of the championship group. Despite being up against it, they avoided relegation in no small part to their South African import. “I’m extremely pleased with my first pro season as I scored 15 goals in 23 games,” the 28-year-old said. She notched up 10 goals in the regular season, which saw her finish joint-third in the top-goalscorers chart, and another five in the play-offs. Her story is far from done though as next she will be heading to Spain’s Primera División where she will become the first South African to play football in the country’s top division for women after signing for Malaga. “It’s a dream come true to be able to play in such a high and competitive league with high profile players from around world,” the forward said after her move. While the South Africa Football Association continues to struggle to get a professional women’s league off the ground, Fulutudilu is showing female footballers that their passion and hard work can take them to top leagues elsewhere. The likes of Linda Motlhalo and Thembi Kgatlana have been making names for themselves with the Houston Dash in the National Women’s Soccer League in the United States. 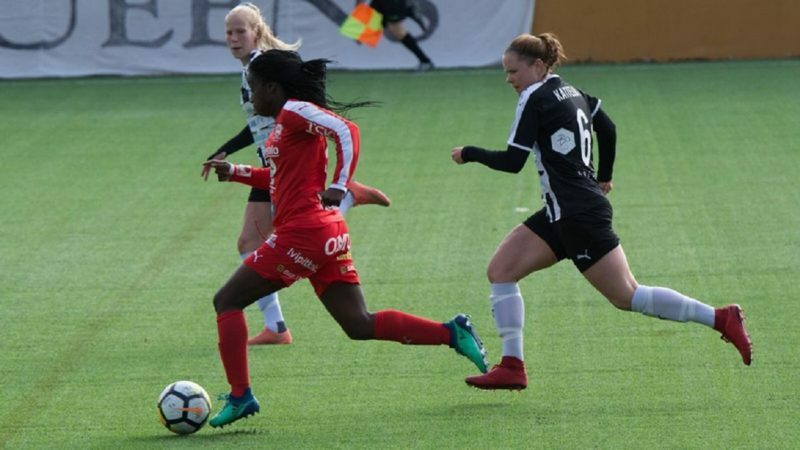 Fulutudilu and fellow Capetonian Leandra Smeda have taken the European route as the latter recently joined Sweden’s Damallsvenskan outfit Vittsjo GIK following a successful spell at Lithuanian club FK Gintra-Universiteta. The experience they gain, though, will do wonders not only for the national women’s team, but will no doubt help the future generations. “I think having so many players play abroad can only help improve Banyana as in the past most of the West African countries would have six to 10 players overseas and that experience always gave them an edge over our national team. Fulutudilu hasn’t been part of the Banyana set-up in recent months with her last cap coming against Chile in October 2018, but she is still hoping for a recall ahead of the 2019 Women’s World Cup in France. “I haven’t retired and I’m still open to the national team if they want my services,” she concluded.